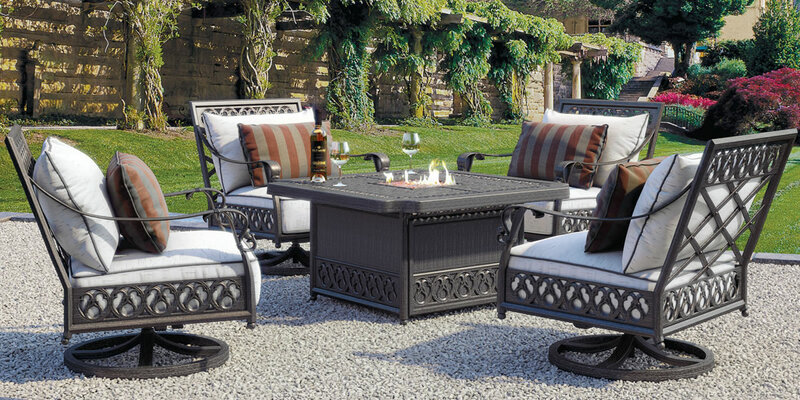 Outdoor Furniture - Shop By Brand - Castelle - Biltmore - Page 1 - Trees n Trends - Home, Fashion & MORE! The ESTATE Collection in the BILTMORE® BY CASTELLE® line offers and invitation to relax in comfort. Inspired by architectural design and classic lattice-work elements found on the Grand Loggia and Library Terrace at Biltmore House, each piece is handcrafted by the artisans of CASTELLE in collaboration with Biltmore. With a true commitment to quality, thoughtful design and timeless style, the collection is carefully-curated through fabrics and finishes to provide products that are relevant to modern lifestyles and as beautiful as they are functional in the very outdoors, beloved by Mr. Vanderbilt himself.